Tension mounted in the Bihar capital on Wednesday as students continued their protest for the second day against fleecing by coaching institutes and politicians jumped on to the bandwagon. Justice Nirmal Yadav of the Punjab and Haryana High Court has finally been transferred to the High Court of Uttarakhand at Nainital. Nearly year-and-a-half after her name surfaced in the cash for judge scam, Justice Yadav’s transfer orders were received by the Punjab and Haryana High Court this evening. Following the Rajasthan High Court order upholding the 50 per cent ceiling on reservation, the state government has reverted Gujjars to the OBC category in the state. The Navy today said an additional agreement between Russia and India would be soon signed to finalise the price of aircraft carrier Admiral Gorshkov. A revenue court here has ordered that the names of relatives of President Pratibha Patil, including her husband Devisingh Shekhawat, to be deleted from the ownership of a disputed piece of agricultural land in a village near here. Even as a debate is under way on Paris’s proposal to put in place a law to ban ‘burqa’ in public, France is said to be looking at India’s request for lifting restrictions on wearing of turban by Sikh children in schools. The Supreme Court today rejected a plea for early hearing of a petition that has challenged the Delhi High Court order quashing criminal charges against the Hinduja brothers in the Bofors pay-off case. Keen to restart stalled Naga talks in April, the UPA government has decided to appoint former petroleum secretary RS Pandey as its new interlocutor to facilitate this dialogue with the major insurgent outfit, the Isak-Muivah faction of the National Socialist Council of Nagaland (NSCN-IM). Pandey has been picked up for this task, as he has served as chief secretary in Nagaland and is said to have a good grasp of the issues that have led to the long spell of insurgency in this north-eastern border state. Clearly aimed at countering imbalance with China on long-range missile front, the Defence Research And Development Organisation today announced that the Agni-V would be tested within one year from now. It all announced that the Agni-III, a 3,500 km range nuclear- tipped missile, was now ready for induction and use by the Indian Armed Forces. As many as five Delhi-based lawyers have filed a criminal complaint in a court here against MNS chief Raj Thackeray for his alleged remark that he would not be responsible if demand for a separate Maharashtra nation arises. Nooriya Haveliwala, arrested for mowing down two persons last month allegedly under the influence of alcohol, has tested positive for drug consumption, the police said today. Three Army jawans were killed in a series of avalanches in Siachen Glacier in the northern part of Jammu and Kashmir today. The students thrashed the owner of a private coaching institute, vandalised property and tore banners and posters of other institutes in the area. Former MP Pappu Yadav was arrested after he went to meet the students at Bazar Samiti locality here to express solidarity and also criticised Tuesday’s police action against them. Yadav submitted a memorandum to Bihar Governor Debanand Konwar demanding that all coaching institutes be closed. The Patna district administration held a meeting with student leaders to redress their grievances amid continued tension, a day after one student, Sachin Sharma, was killed in firing by a security guard of a coaching centre. Several other students were injured in clashes with police Tuesday as over 1,000 students rampaged to protest alleged cheating by the coaching institutes. Lok Janshakti Party chief Ram Vilas Paswan visited the injured students in Patna Medical College and Hospital on Wednesday and announced that his part’s student wing will observe a protest day across the state on Thursday against police action on students. Opposition Rashtriya Janata Dal (RJD) chief Lalu Prasad and Congress leaders also condemned the police action against students. The state government has announced an ex gratia of Rs.1.5 lakh for Sharma's family. Patna SSP Vineet Vinayak on Wednesday said police staged a flag march to maintain law and order here even as protests spread to nearby towns of Barh and Ara. Available information suggests that Justice Yadav has been asked to join the high court at Nainital by February 24. Justice Yadav is on leave since her name has been surfaced in the scam in August 2008. The transfer order came just a day after the Punjab and Haryana High Court Bar Association took up the issue and decided to call upon the President of India and the Union Law Minister to convey concern on “grave miscarriage of justice” following the submission of a closure report by the CBI. The CBI stated it could not go ahead in the matter following the denial of sanction for Justice Yadav’s prosecution. The scam had surfaced in August 2008 with the misdelivery of Rs 15 lakh at the residence of another judge with similar name Justice Nirmaljit Kaur. The CBI, investigating the case, has already stated in its closure report that “Justice Nirmaljit Kaur had nothing to do with the same”; and the money had, in fact, been demanded by Justice Yadav. Expressing concern over the way the scam was being wrapped up, a former Supreme Court Judge and three former Chief Justices of the high courts, too, had only recently asked the Chief Justice of India (CJI) to clear the air surrounding the rip-off. They had also sought “full disclosure” of the report by a three-Judge committee, set up by the CJI to look into the scam. Former Judge of the Supreme Court Justice Kuldip Singh, former Chief Justice of the Delhi High Court Justice RN Aggarwal, former Chief Justice of the Allahabad High Court Justice SS Sodhi, and former Chief Justice of the Sikkim High Court Justice MS Gujral signed the letter. 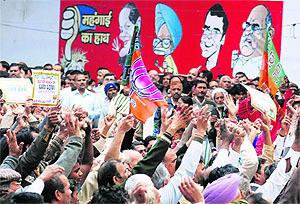 The government said it had provisionally modified the reservation system in recruitments and admissions in view of the high court order that indicated Gujjars, Rebaris and Gadia-Lohars would have to wait longer for the 5 per cent quota under the Specially Backward Class category as promised by the government, though they would continue to get reservation under the OBC category. As per the modification, the SCs would get 16 per cent, the STs would get 12 per cent and the OBCs would get 21 per cent reservation in the government jobs and educational institutions in the state. The state government order modifying the reservation to pre-July, 2009, status should remain in force till the High Court passes any further order or judgment on the petitions that challenged the Reservation Act of 2009. The Act that came in force in July, 2009, had granted 5 per cent separate quota to the Specially Backward Classes (Gujjars, Rebaris and Gadia-Lohars) and 14 per cent to the Economically Backward Classes (EBCs), taking the total reservation in Rajasthan to 68 per cent. In the case of G Sharma versus the state of Rajasthan, which challenges the reservation limit being extended to 68 per cent to accommodate the Specially and Economically Backward Classes, the HC had passed two interim orders on October 12 and November 4 last, asking the government to maintain the maximum limit of 50 per cent quota in the state jobs educational institutions. These orders had forced the government to put on hold implementation of the Reservation Act passed in the aftermath of violent Gujjar agitations of 2007 and 2008. Meanwhile, it is to be seen as to how the Gujjars react to the decision. It was some time back that Gujjar leader Kirori Singh Bainsla had urged the state government to freeze recruitments in the government sector till the reservation issue was settled in the court. Additional District and Sessions Judge Raj Sekhar Attri has postponed the hearing on an appeal filed in connection with the Ruchika Girhotra molestation case till March 10. The same will now be heard on March 10, 11 and 12. With this, Rathore’s bail also stands extended. Rathore, who reached the courts in the morning with his wife Abha and advocate ND Sharma, appealed to the judge to put off the case for a few days, as his lawyer, being injured, was not in a position to take up the matter. ND Sharma was also injured on Monday when Rathore was attacked by a youth outside the court premises. While saving Rathore, he was hurt on the hand and had received 11 stitches. The accused, identified as second-year student of the National Institute of Technology, Ahmedabad Utsav Sharma, attacked Rathore with a knife while he and his wife, Abha Rathore, were proceeding towards their car to have lunch. Rathore received cuts on the cheek and the neck. The CBI had filed a counter-appeal for the enhancement of sentence for former Haryana DGP SPS Rathore in the ongoing Ruchika Girhotra case on February 4 and February 8 was fixed for taking up the appeal. This was to be simultaneously heard with the appeal filed by SPS Rathore against his conviction. Earlier, Rathore had filed an appeal against his conviction in the case by a CBI special court in Chandigarh on January 13. Utsav Sharma, who attacked former Haryana DGP SPS Rathore in front of the district courts on Monday, has been remanded in judicial custody till February 24. His bail plea is slated to come up for arguments before the court on Thursday. Utsav had attacked Rathore with a knife outside the district courts on Monday. During the hearing, parents of Utsav Sharma and some acquaintance were present in the court. Russian Security Council Secretary Nikolai Patrushev, during his two-day visit to India last week, had said an additional agreement between Russia and India would be signed to pave the way for handing over of the carrier to India. The Russian official, however, refrained from mentioning the issue of price, which would be the central focus of the new agreement. He simply said the agreement was about modernisation of the ship. Talking to the TNS today on the sidelines of the International Conference on Electronic Warfare (EWCI) underway here, Vice-Admiral RK Dhowan, deputy chief of the Naval Staff, said the additional agreement would cover “all outstanding issues between India and Russia with regard to the aircraft carrier”. Asked what he meant by “outstanding issues”, Dhowan said the new agreement would be primarily pertaining to the “cost of the carrier”. The ship, rechristened INS Vikramaditya, was bought for $974 million but the Russian shipyard Sevmash hiked its costs for the repair and refit work to an additional $2.9 billion in 2007. The Defence Ministry had earlier indicated it was willing to pay $2.2 billion amid objections from the official auditor, the Comptroller and Auditor General. The discussions between the two sides apparently concluded during November last year when a “mutually agreed” final price for the carrier was worked out. The Navy’s admission today of signing a new agreement with Russia for acquiring the aircraft carrier is also an indication that the government has made up its mind to pay an enhanced price for the Soviet era aircraft carrier which was originally named Baku. The ship has displacement capacity of 45,000 tons. It has maximum speed of 32 knots and an endurance of 13,500 nautical miles (25,000 km) at a cruising speed of 18 knots. Back in 2004, Russia decided to sell the ship to India but th wrangling over its cost had delayed its transfer to the Indian Navy. On the progress on the front of the indigenous aircraft carrier being manufactured at the Kochi shipyard, Dhowan said work was going on satisfactorily and the ship was expected to be rolled out in 2014. The order by Sub Divisional Officer (SDO) Ashok Amankar, in quasi-judicial authority, came on a petition by one Kishore Bansod, who had claimed that the Shekhawat clan had allegedly got their names included in the land title. The Rashtrapati Bhawan in Delhi declined to comment on the issue. Congress spokesman Abhishek Singhvi also said that he would not be in a position to react without knowing the details of the case. In a recent order, the SDO had directed that the entry relating to the names of six persons belonging to the Shekhawat family be deleted from the official land records. The six respondents in the case include, President's husband Devisingh Shekhawat, five of his relatives, the local Revenue Inspector and village 'Talathi', a lower-level official who maintains land records. Prime Minister Manmohan Singh had given a memorandum to French President Nicholas Sarkozy on this issue when they met last in November last year on the margins of the Commonwealth Summit and the memorandum was being considered, diplomatic sources said today. The ban on wearing of turban in schools in France has been agitating the Sikh community since March 2004 when the French Parliament passes a law banning all ostentatious religious symbols and signs in public places, such as schools, hospitals and town halls. The Sikhs have given several representations to the Indian Government to take up the issue with the French authorities. The issue was also highlighted by the Sikhs from France during the Pravasi Bharatiya Divas (PBD) celebrations last month.Meanwhile, France is believed to be going through the recommendations of a cross-party panel of 32 law-makers that had been asked to investigate whether women in France should be allowed to wear the head-to-toe Islamic veil. “It is not possible to give preference to your appeal unless there is something urgent,” a Bench headed by Chief Justice KG Balakrishnan told advocate Ajay Agrawal, the petitioner who sought urgent hearing. Solicitor General Gopal Subramanium opposed the plea, arguing that it was a criminal case, not public interest litigation. Agrawal said the apex court had issued a notice to the CBI on the appeal about five years ago but the hearing was yet to take place. The CBI was interested in protecting the accused, not prosecuting them, he said. Further, the CBI had moved an application before the trial court for withdrawal of the case against Italian businessman Ottavio Quattrocchi, the main accused in the pay-off case. The advocate had filed the petition against the May 31, 2005, High Court verdict as the CBI failed to appeal against it within the mandatory 90 days. Former Home Secretary K. Padmanabhaiah, the previous interlocutor, had been engaged in peace talks with the Naga insurgent group since 1999. These deliberations turned out to be inconclusive, though the Centre maintained that some forward movement had taken place in resolving the Naga problem. The last meeting between New Delhi and the NSCN (IM faction) representatives, which ended in a stalemate, was held in Zurich last March. Subsequently, the UPA government decided to discontinue with Padmanabhaiah, who had held more than 50 rounds of talks with NSCN (IM) representatives. This means India would induct a long-range nuclear warhead into its arsenal and gives itself the long-overdue “second strike” defence capability. India is pledged not to undertake any first nuclear strike. The upcoming Agni-V would have a range of about 5,500 km and simultaneously, systems are being developed to make the missile “mobile”. Meaning it would be capable of being fired from a truck-mounted launcher or rail wagon-mounted launcher. The Agni-V would not be Inter Continental Ballistic Missile (ICBM), that has range of 7,000 km or above, in the classic sense, but would be close enough. Metropolitan Magistrate Jitender Mishra would record the statements on February 16 of advocate Ashish Rai and his four collegaues before taking congnisance of the complaint against Thackeray. The complaint seeks to prosecute the Maharashtra Navnirman Sena (MNS) leader under various provisions of IPC dealing with attempting to wage war against the nation, promoting enemity between classes, statements against national integration and public peace. “We received Nooriya’s drug report from the forensic lab today and she has tested positive for consumption of narcotic substances like morphine and cannabis,” Additional Commissioner of Police RK Padmanabhan said. A 27-year-old beautician, Nooriya, on January 30 was driving towards her home at Colaba in south Mumbai, when she lost control over her Honda CRV vehicle and hit a bike and a police jeep.